Steve Raymond has been in the tourism industry since 1972. He began his career in an incentive house for a salary of USD 50 per month. In 1977 Steve started a receptive company of his own in San Francisco. By ’84 it was one of the largest in the city. In 1985 he went over to Southeast Asia, and began a destination management company in Thailand. He did this until his arrest in ’89. Steve remained in various Thai prisons for nearly two years, even after being acquitted of committing any crime. After sitting in a Thai immigration jail for over a year because his passport had been cancelled by the US Embassy when he was originally arrested, he was brought back to the states where a judge ordered his release, stating that “there is no evidence that a crime was committed” – Two years and two weeks after his original arrest. Published in 1994, the book titled “The Poison River” describes Steve’s travails for those two plus years. The day he walked out of jail, he entered Mari Zatman’s office and she hired him on the spot. Mari had worked for Steve’s San Francisco-based company. After leaving his company, she started a hotel booking company – sort of like an online travel agency before the internet developed – where people called in or faxed in hotel reservation requests. In 1993, a close friend told Steve she was buying a hotel in San Francisco and wanted Steve to take helm as the project manager. Steve left the hotel booking company and went on as project manager and later general manager and director of sales and marketing for the Renoir Hotel throughout the ‘90s. In 2000 Steve was hired by the Windsor group to manage two of their restaurants and open a third and to run the sales and marketing department for both the Windsor Saigon Hotel and the company’s various restaurants. In 2004, when the company opened the Windsor Plaza Hotel, Steve added a stint as the General Manager to his resume. At the same time, Steve was writing all the English copy and editing of all the English text for the company. At the same time, Steve was also giving seminars on hotel marketing. A friend of the owner of the Pandanus Resort in Phan Thiet attended a seminar and then suggested that Steve help to turn around the struggling venture. When he went on a site inspection of the resort, he was offered the position of General Manager. Deciding that life in Phan Thiet would be less stressful than working at the Windsor group, he accepted the position. When he left the Windsor group, the company had to hire four people to do the various jobs he was doing. Steve has been at Pandanus Resort for nearly a decade. Citypassguide.com sat down with Steve to help dissect the Phan Thiet market, and its tentative future. CPG.com: How much has the market changed since 2006? Steve: There are three times as many establishments as there was when I arrived here. At that time, almost all of the development in Ham Tien was on the West end. Rang Beach in Ham Tien was first discovered by many foreigners when they descended on the area on October 24, 1995 to watch a solar eclipse. Scientists had predicted that one of the best places in the world to see the total eclipse was on the beaches northeast of the city center. Guidebooks like the Lonely Planet directed would-be astronomers to the beach in front of Mui Ne, incorrectly referring to Ham Tien as ‘Mui Ne’ and Rang Beach as ‘Mui Ne Beach’. From that day onward, tourists mistakenly called everything east of the city center Mui Ne, so by the time I go here everything was being called Mui Ne. The initial markets were mainly German, with a sizable French community and a fair amount of Australian and European kite surfers. The German market has stabilized, while other markets have continued to develop. Right after the Middle Eastern revolution, the Russians started coming in. In 2011, Egypt was the most popular destination for Russians, but since the revolution they started pouring into Vietnam. After the drop of the ruble in 2014, some resorts lost up to 75% of their Russian market. The Vietnamese market was always increasing, but it started to grow more substantially after the road project finished. Before that it took eight hours to get here – now it takes three and a half. I have never seen so many Vietnamese in the first four months of the year until this winter. As for the Korean market, it’s up, but their idea of relaxation is not to sit on a beach and tan themselves. They only stay a few days. Part of the reason Koreans come here is to play golf. But since Rang Dong Corporation closed Ocean Dunes, there aren’t so many of them coming to golf. They liked having two golf courses to play on, rather than just one. CPG.com: How do you see the market evolving in the near future? Steve: We are focusing now on markets that weren’t primary. Our business with the Swiss has tripled, Denmark has tripled, the Finnish market has doubled. Now that the Brits have direct flights, they don’t have to jump through hoops to get here, so their business has grown. Vietnamese hoteliers don’t want to talk to anybody about their figures. In all of Phan Thiet we only have 10 or 12 willing to disclose stats and some of those are questionable. I don’t trust the government figures, since they probably fudge them to look good with Hanoi. The only information I get is from foreign hoteliers. Compared to San Francisco, cooperation is almost nonexistent. It’s difficult to get proper stats. As for Binh Thuan Tourism… it is ineffective, to say the least. They don’t know their head from their tail. They want to use the name Mui Ne because that’s the name tourists know, but what about other wards? Hotels there get upset that they’re giving out a CD ROM and book that says “Mui Ne”. You open the CD ROM, and the first thing it has is a map of Phan Thiet city. How stupid is that. The Binh Thaun Tourism website is only in Vietnamese. It’s very poorly made. They never previously attended the ATF (ASEAN Tourism Forum). I think they just went this year for the first time. They have no idea how to promote tourism to Phan Thiet. Their idea of promotion was to run a couple of festivals during the year and they didn’t even know how to do that – remember the balloon festival a couple years ago? I was the only foreigner there. CPG.com: There’s been a lot of noise about the Phan Thiet airport that is now being signed by the prime minister. Are they actually building it? Steve: It is under construction. My farm is near there, and I see trucks going in and out. They’re working on something. At the same time, they’re sitting in Hanoi, arguing about whether or not they’re going to pay the money to build it. They’re saying the money should be spent in other places. CPG.com: And what’s your opinion on that? Steve: First of all, if they’re going to build an airport, they should have used the old American military airport. The runway is there and everything. The reason they haven’t might be either the government officials don’t own the military airport, or they don’t own the land where they want to build it now [laughs]. Furthermore, the new Ho Chi Minh City airport is going to be built in Long Thanh, two and a half hours drive from the resorts in Phan Thiet. Who’s going to want to wait for a connection and then fly here, then take a taxi, when they can be in their resort in two and a half hours by taxi from the Ho Chi Minh City airport? I think someone’s making money by building the new airport here and not looking at whether it’s the smart thing to do or it is good for the country. CPG.com: You are the TripAdvisor expert for the area of Phan Thiet. Can you tell us what you do for them? Steve: Every day I respond to people on the forum. And basically that’s it. I answer all the people that are asking questions about the area, what to do, where to go – every question you can possibly imagine. CPG.com: One of the key things you’ve been trying to convince the industry as a whole of is the proper geographic naming of the region. Can you expand on that? Steve: The truth is before they built any resorts here, the first guidebook ever printed for the area, Lonely Planet, called the whole area Mui Ne. What is problematic is that it confuses the tourists. They have no idea where they’re staying. 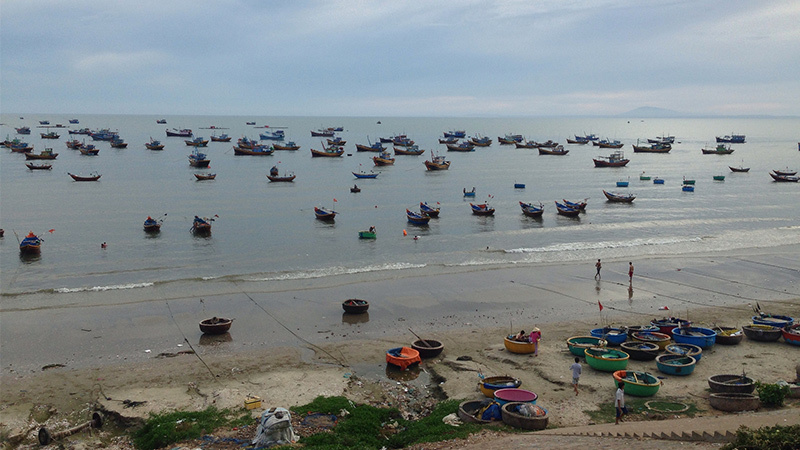 Phan Thiet covers 60 kilometers of coastline. Every area in that region has something different to offer. They should be identified as being in that specific area so that people know exactly what they’re getting into. The tourism authorities only need to promote one brand name – Phan Thiet. Because it’s all Phan Thiet. I finally got TripAdvisor to recognize the different areas. If Binh Thuan Tourism did that, people would realize how much there is to do there. Then guests can say, “I prefer to be away from all the noise,” or “I prefer to be in the middle of all the action and noise.” You can have areas for retired people, younger generations, families, etc. CPG.com: Regarding TripAdvisor, do you think there are rankings, presented in the Phan Thiet area, which are manipulated? Steve: I think some of them are manipulated, but I have no proof. I also think a lot of the government statistics are not accurate. Living in Vietnam for 15 years, I’ve become very cynical about anything the government says or does. They often don’t do what they say they’re going to do, and if they do, they take forever doing it. I’m sure the figures of tourists coming into Vietnam are correct – they know how many people come through the airports. That’s easier to quantify that than the number of people coming to Phan Thiet. It’s not just the government, but I don’t even trust some of those hotels that share their figures with us. We did a cross investigation and found that Allezboo and Saigon Mui Ne, for example, were fudging their figures. So how would Binh Thuan Tourism know how many people are coming in and what nationalities they are? The police collect passport information from the larger resorts, but not necessarily from small guest houses, and there are over a hundred of them, so I don’t think they have any idea. CPG.com: We recently heard increasing reports that police are going after some of the expats that are living here and renting land. Is this accurate? Steve: Many Vietnamese government officials are xenophobic. They don’t realize it, but they are. This comes from 10 centuries or more of being overrun by foreigners: Mongols, Chinese, Japanese, French, Americans… and their reflex is to be xenophobic. They have a tendency to really try to make it difficult for foreigners to stay here for any extended period of time. If they wanted foreigners to live here, they would welcome retirees, for example. They would welcome them with open arms. Retirees don’t take work from the locals. They only add to the economy. If they wanted foreigners to live here, they’d be doing what other countries like Thailand and Panama are doing: they would advertise that they want people to retire here. CPG.com: You have an objective to retire here. What makes you stay? Steve: I’ve invested in the country. I started a tofu business. The land is not in my name, but I’m listed as a foreign investor in the company, and so I can get a visa. They shouldn’t have to do that for retirees. They should want retirees to come here and bring their money and help the economy. CPG.com: What is it, though, that made you invest in this country and call it home? Steve: Various reasons. I love Vietnamese people. I love warm weather. And what can I say, I love Vietnamese guys! Somebody told me to compare Vietnam to Thailand when I got here. When you’re in Thailand, you’re a foreigner; you’re a “farang.” You’re different. Thai people call each other ‘pi or nong’; brother or sister. But, if you’re a foreigner you’re always a farang. Vietnamese view other Vietnamese as competitors, but foreigners are their friends. And that’s the way they treat us, and I love it. If the government would just have the same feeling towards foreigners that the people do, then it would be really good. CPG.com: We know you’re sensitive to the issue of pollution. Can you tell us what is happening in the greater Phan Thiet area, in relation to this? Steve: I see ten times as much trash in this area as I did in 2006. There is garbage everywhere. You drive through Mui Ne, and all empty lots are full of trash. When the new highway was first built, it was pristine. Now you drive along the new highway and there’s garbage everywhere you look. The fishermen have no clue about what they’re doing to the environment by dumping their Styrofoam and their plastic and every piece of garbage overboard. It kills life in the sea and washes up on the shores. You go out to the public beaches and they’re disgusting. The tourists don’t want to come to a destination that’s full of garbage. You follow a bus from Saigon to Phan Thiet and you see candy wrappers, plastic cups, or plastic bags flying out of the windows. They don’t care where they are, they just drop garbage anywhere. If the police see you throwing garbage out of a moving vehicle in America, you have to pay a fine in the thousands of dollars. The problem is that the government doesn’t even consider this to be a problem. If they did, they would make laws and fine people for dumping garbage and then tell the police to follow up. That would significantly reduce the amount of garbage. Protecting the environment is not a priority for the government. Looking for the perfect spot for your next unique and exhilarating vacation? Let us present to you Mui Ne – a paradise not only for wave and kite surfers, but for everyone who loves the ocean, sandy beaches, tropical fruits and fresh seafood. Only a three-to-four-hour bus ride from the hustle and bustle of Ho Chi Minh City, one can journey along the winding, coastal road whilst climbing uphill to the ancient towers left by the Cham civilization before reaching the white crescent sandy beaches known as Mui Ne Bay. Mui Ne or Ham Tien? Did you know that Mui Ne itself was only a small fishing village? This secluded southern beach has seen rapid development over the past 20 years, and has become one of the forefront tourist destinations in the country. Some of the first travellers arrived here in the mid-1990s and camped on the sand under the shade of the thousands of coconut trees. However, this place was just too beautiful to remain unknown. Ham Tien is the most popular strip of land in the region, and it is here you can find nearly 15 kilometres of pristine beach. Hotels and resorts are primarily located on the beach side, while restaurants, shops and budget accommodation lay on the opposite. Mui Ne has become a more relaxed alternative to the lively Nha Trang, and its natural landscape is so unique in comparison that it has little problem bringing in tourists from all across the globe. Only a few hours’ drive from Ho Chi Minh and its international airport, Mui Ne is a perfect match for both tourists tired of airline travel and Saigoneers keen to escape the city for a weekend trip. Buses leave from HCMC to Mui Ne several times a day and cost only or dollars, which is a pleasant alternative to the domestic airport’s overwhelming environment. Taxi and mini bus transportation depend on the vehicle type and season, but are also quite reasonably priced. Getting around in Mui Ne is never a hassle, as there are many metered taxis throughout the city. For those who like to feel the fresh air and move around freely, renting a motorbike is very cheap and easy to come by. In terms of size, the town is quite small and many places can be reached on foot as well . There are no popular activities like diving or snorkelling, but when central Vietnam is drowning under tropical rainfalls and storms, Mui Ne stays safe and dry. 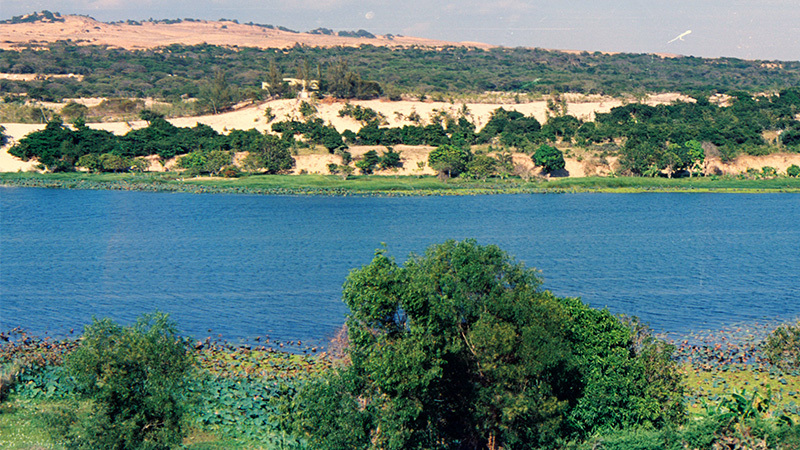 The sand dunes have created a unique microclimate, and even during the rainy season (from June to September), the rain does not inconvenience its guests and inhabitants. Phan Thiet is famous for its favourable year-round weather and it has the lowest precipitation average in the country. Accordingly, the average daily temperature often hovers comfortably around 23 - 30 degrees Celsius. Although Mui Ne is considered mainly a kitesurfing destination for people in search of wind and waves, it still has everything you need for a relaxing beach holiday, including several natural and historical attractions. Whether you want to lounge on the shores, do some adventure hiking on one of Mui Ne’s numerous sand dunes, rent a luxury villa or cheap guest house, try exotic dishes or some Western cuisines, get lost in the late-night dance clubs or enjoy a quiet family spot – Mui Ne has it all. Oozing with charm and a surfer’s casual ambiance, you won’t see any tall buildings here: local resorts are mostly one- or two-storey cottages hidden in lush, tropical gardens. The fishing village still coexists with the tourist area, and while the lights of the fishing boats twinkle in the darkness of the ocean till dawn, by day, kites suddenly fill the sky as they gracefully undulate in the wind. 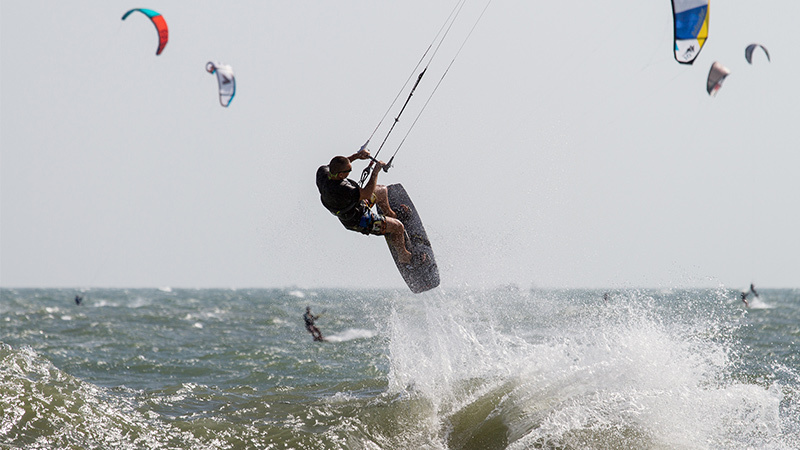 These days, Mui Ne has become the adrenaline capital of Vietnam due to its vast array of water sports. The ocean is warm all year round and beaches are wide with stunning hills of sand. Although gorgeous, these warm waters are rarely calm – as the wind cools you down, it also brings sizeable waves crashing onto the shore. The surf is ideal from August to December, but on the scarce occasion when the sea remains calm, you can rent an SUP (stand-up paddle board) or jet ski. For the experienced kite surfer, the strong, stable winds provide one of the best surf environments in the world. For those that are inexperienced but willing to try, there are dozens of kite schools that will help you get your feet wet for a reasonable price. Spring in Mui Ne (Phan Thiet) is a season of refreshment when the waves are always at their strongest, and the sand dunes show off their breathtaking beauty. Summer here is a season of growth and reward, when we see flame-red dragon fruits hidden amongst the green cactuses. Spring and summer are the special seasons for visitors to indulge themselves in all the charm this beach city brings to them. But the true beauty of Phan Thiet is found not only in its seasonal gifts, but also in its incomparable sunrise and sunset. For this, Bau Trang is the best place to experience mother nature’s majesty. Bau Trang literally means ‘White Lakes’. In the past, there was an imposing, isolated lake surrounded on all sides by an enormous expanse of desert. Later, the government decided to build dams which separated the lake into two parts. The larger of the two goes by the name Lady Lake, and the smaller portion is referred to as Gentleman Lake. Sixty-five kilometres northeast from Phan Thiet, Bau Trang is located in the Bac Binh Village. Visitors usually take jeeps to Bau Trang, sightsee along the cliffs of Mui Ne and enjoy the splendid views of the ocean on the way to this magnificent attraction. To experience dawn at Bau Trang from Mui Ne, it’s best to start your trip at 5 a.m. A quiet morning is always the ideal time to drive through the silence of the desert, and when you pass through the Red Sand Dunes, the first glimmer of the rising sun from the East will certainly catch your eyes. Initially, red is the colour that impresses you as you traverse these noble lands. Soon after, you will be embraced with wonder by the remarkable contrast of the monumental White Sand Dunes. 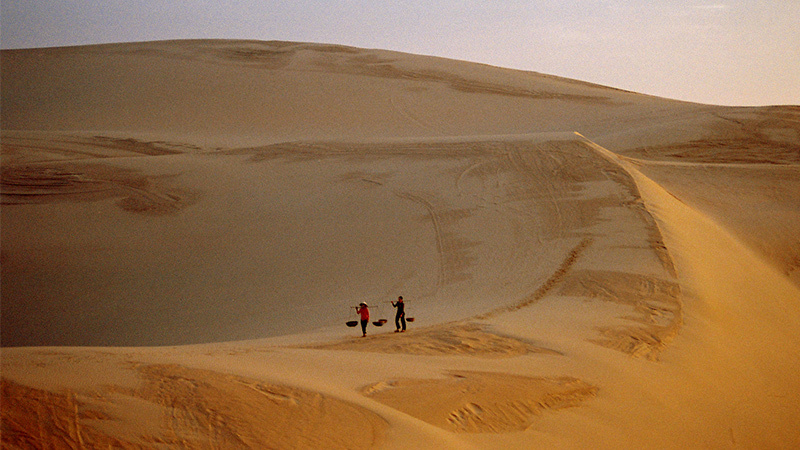 Upon reaching the summit of the dunes, there are many images to stimulate your senses. The lakes radiate beneath the sunlight as the wind and sand harmoniously dance atop this solitary landscape. Around 6 p.m., the sun makes its daily trip down the horizon, painting the desert with a montage of changing colours. The lake’s water is transformed from emerald green to bright blue, while the Great White Dunes begin to shift to a burnt orange under the falling sun. A day in Bau Trang gives its guests the chance to experience a chameleon of colour. Bau Trang, wild and rustic, is a rousing work of art in motion, and one visit here will prove to be a compelling run-in with the power of mother nature.